The second half of this season’s The Walking Dead has been pure chaos. The Saviors have proven to be massive in numbers and are a constant threat to Rick and our group of survivors. Things reached a boiling point during last Sunday’s episode “East” when Dwight reappeared and shot everyone’s favorite redneck, Daryl Dixon, as the screen cut to black. Since this week’s 90-minute finale will include the deadly introduction of comic book villain Negan, fans are worrying that it will be the last time we get to see Daryl in action. You should be very worried about Daryl. 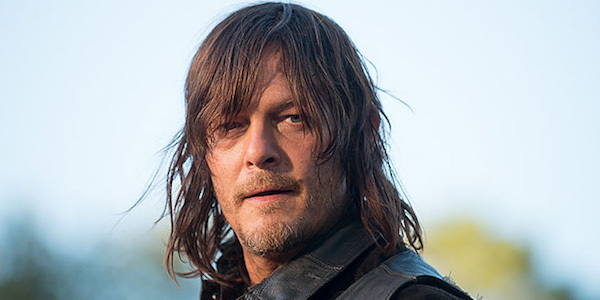 Of course, The Walking Dead viewers were already very worried about Daryl. This began when he saved Sasha and Abraham from the Saviors with an RPG, and fans thought he would have to atone for that action. Last episode saw him going after Dwight, much to the chagrin of Glenn, Rosita, and Michonne, and it all resulted in the group’s capture and Daryl being the victim of a mysterious gunshot wound. To add fuel to the Daryl fire, AMC’s aftershow The Talking Dead just tweeted out who one of their guests will be for the finale episode. This seems like a bad sign for Mr. Dixon. Usually actors end up on the couch of The Talking Dead after their character’s untimely death. We get to say goodbye to the survivor, especially during the “in memoriam” segment. Since Norman Reedus will be a guest on the after show, we could assume that Daryl would be meeting his maker in the finale. Plus, there’s the title of the finale episode “Last Day On Earth” which only gives The Walking Dead fans more anxiety. Of course, the showrunners and writers behind The Walking Dead might be using Daryl’s precarious fate as a red herring for the true fatality. TWD tends to go for unexpected deaths, and it seems that all of these hints would make Daryl’s death a bit obvious. Clearly Daryl will be in poor shape after being shot by Dwight, and his spirit will likely be even more broken after feeling responsible for both Denise’s death and his friends’ capture. We’ll just have to wait until this Sunday’s episode of The Walking Dead for the answers to our questions. The Walking Dead airs Sunday nights on AMC.